An idea that's been kicking around the Web since roughly Halloween, but--what the hell, it's Christmas, let's go for it! 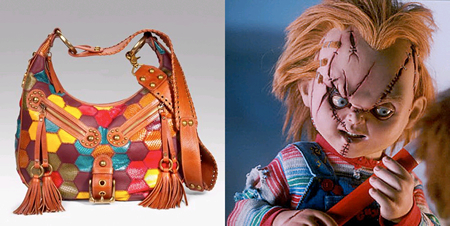 From Radar Online comes the perfect gift suggestion for film aficionados (more likely aficionadesses, but you never can tell ... ): "Handbags of Horror," a mock designer collection of oversize purses that purports to channel assorted screen monsters of the past. 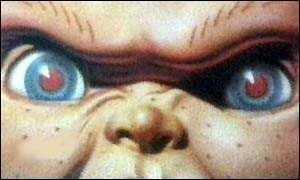 At the head of this unruly brood is—what best to call it?—the Chucky, a patchwork of sewn leather gewgaws in bright designer colors, with "carroty tufts" that, according to Radar's description, have a "deceptive 'playful' quality" (like the Child's Play series itself, no doubt). 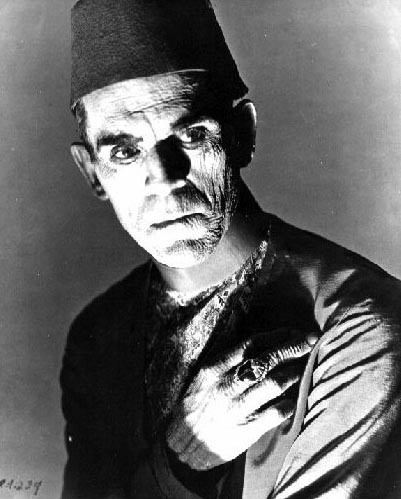 Up next, the Mummy, a confection of ruffles and chains that presumably brings to mind Boris Karloff lurching down mausoleum corridors to harass a hysterically screaming Zita Johann. 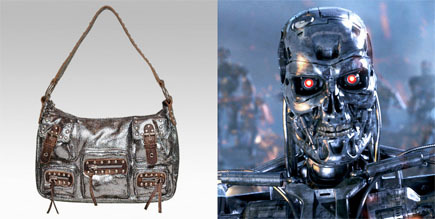 There's also the shiny metallic Betsey Johnson Terminator spin-off, a bag that only a certain governor of California would ever be caught dead or alive carrying, as well as the Reanimator, a "brutally poisoned" design of Napa leather described as an "homage to Tarman, the star zombie in 1985's Return of the Living Dead." 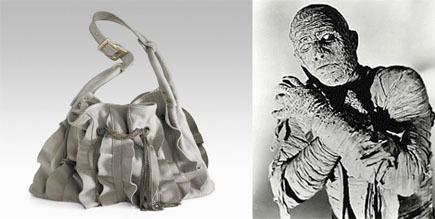 Not to mention a fuzzy brown nuisance straight out of Gremlins, or a scaly piece of swamp salvage I'll simply dub the Gill Man: what fashionably distressed damsel wouldn't want that in her black lagoon Christmas stocking? Unfortunately MIA from this accessory barrage is Attack of the 50 Foot Coach Bag, to commemorate the ineluctable Allison Hayes, which isn't part of the collection but obviously ought to be. Ergo, all in all, a real Christmas bonanza—hosanna in excelsis, right?